December | 2009 | Always On! Why Teach? This Is Why. In 2003, I taught a number of classes at the Katherine Gibbs School of New York. These included Advertising, Sales, Finance, Economics and Mathematics. 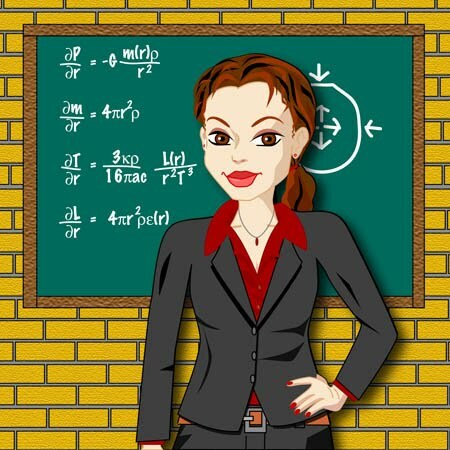 Having attended college and graduate school with some of the hardest working, most highly motivated, most competitive students in the world, and having just taught a class at the prestigious Stern School at NYU, it was a culture shock to encounter a classroom of students whose attitude towards school was, for many, jaded, wary and frustrated. While virtually all of my classmates and students at Harvard, Wharton and NYU saw their attendance at these schools as part of an educational plan created years ago and never questioned, my Gibbs students had graduated high school but had not gone on to college. Enrolling at Gibbs was, for them, a first step towards getting a college degree, or a way to actualize a dream to own their own business, “become a CEO,” create a line of licensed products, or simply move out of their role at the checkout counter of a retail chain. Teaching these classes – particularly the large ones – was often frustrating and surprising. There was cheating, lying, real or forged doctors’ notes for missed classes, no-shows for exams, and in-class cell phone usage, talking and eating to contend with. In addition, there were competing drains on their time – families, work, and, in one case, an unwanted pregnancy. But, as many teachers will tell you, among the frustrations, there were also gems. Students whose lives were truly touched by their interaction with me and my enthusiasm and commitment. Students that I exposed to experiences that were commonplace to me but first-time opportunities for them – such as seeing a video of a ballet dancer (I don’t remember the context) or even an office environment. And many were affected by the opportunity I offered them to excel – without cheating. At NYU, I often drilled students with practice questions for exams. I made a game out of it. During these Jeopardy review sessions, I would go around the room, presenting each student with exam-type questions. I would continue to feed each student questions until they got one wrong. Then I would ask the rest of the class to try to answer the problem and teach the topic to the rest of the class. If no one could adequately explain the answer, I would take some time to review that topic – therefore pinpointing the subjects that needed the most explanation. And, of course, there was candy involved, thanks to the generous budget of the Marketing Department. At Gibbs, I would drill a student until he or she got the question RIGHT, keep score and reward the high scorers with magazines and other loot from my publishing jobs. And for the Gibbs students, not only were they given the questions in advance in the form of problem sets but ALL the exam questions came from these problem sets. So if they mastered the problem sets, they could master the exam. In fact, for my first class, the largest, I provided the actual exam in advance. Students had a direct roadmap to acing the exam (some with a 100% score) if they so desired. Many did not, which was disappointing and somewhat perplexing, but some did, which was a confidence-boosting, elation-creating and often first-time accomplishment for the student, one that did not come from cheating but from preparation. Another opportunity I offered for success was extra credit. Seeking out and taking advantage of extra credit was a no-brainer for me – a habit my father had instilled in me at a young age. It still shocks me that there were students at both NYU and Gibbs that did not answer extra credit questions on exams – particularly because they were usually giveaways in which it was hard to give a wrong answer. Well, in my current endeavor to digitize all paper in my apartment – a daunting task that initially freed up a lot of shelf space in my closet that is now populated by shoe boxes, making me wonder whether my purchase of a high-end scanner was an enabler or gateway for shoe purchases. But I digress. The point of this 6am entry is to share with you some of the interesting and inspirational responses I received from my students to these extra credit questions and to the questions I asked at the beginning of the semester in an effort to get to know the students and have them identify a goal towards which they were working. Without further ado, here is a sampling – as written including spelling. But one last caveat, these papers do not include the questions, so I will have to surmise them from the answers. 1) What did you learn from this class and how will it help you professionally? “I have definitely learned that listening skills are important. In the past, I was a bad listener. I would interrupt a relative or a friend when they are in the middle of their sentence. And at the job, I definitely did evaluative listening because I tried to listen but did not try to understand. Since I started my “Principles of Sales” class, I am practicing active listening; I must say that it is difficult, but it will get easier with practice. Professor, I was not practicing active listening when you told the class about the elevator [I pointed out that two bells means the elevator is going down, one bell equals going up], but I will try to remember. I would also like to tell you that you have truly been a great influence on me. You have patience and tolerance and therefore, empathy. This I have also learnt in this class. 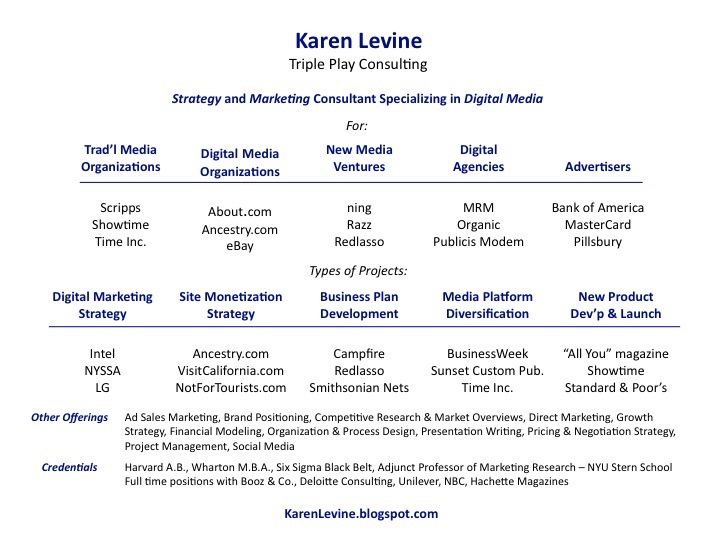 In 2001, the publisher of the five-month old LUCKY magazine asked me to write a presentation addressing the question: “Why Launch a Magazine about Shopping at the Beginning of an Economic Downturn?” I gave her three answers: (1) Consumers are ready for the combined benefits of fashion magazines, catalog shopping & e-commerce, (2) Twenty something women who love to shop… love to shop! 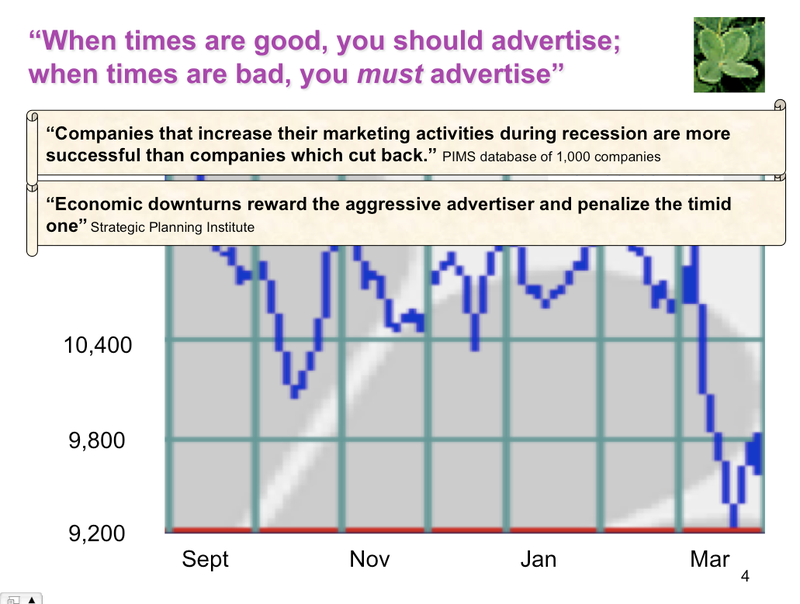 and (3) When times are good, you should advertise; when times are bad, you must advertise. 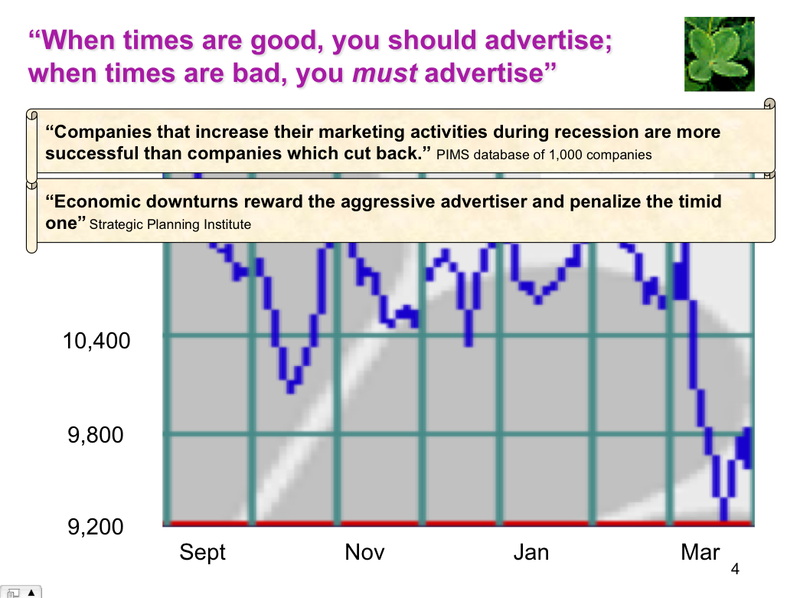 – “Companies that increase their marketing activities during the recession are more successful than companies which cut back.” PIMS database of 1,000 companies. I have always felt a sort of sympathy for car manufacturers spending millions of dollars on television advertising that was bound to get lost in the clutter of two to three automotive commercials per commercial pod (one national, one local and, more recently a second national ad separated from the first by some kind of “pod-breaker”). Personally, I found myself forwarding through automotive ads on a somewhat regular basis despite my being generally inclined to watch TV commercials. But it was a no win situation for automotive brands. While magazine publishers tried valiantly to impress upon them the value of print advertisements, car companies could not afford to take money out of TV so long as their peers were still there. Fast forward to 2008 and 2009 and a sudden automotive silence within TV commercial pods. It was eery and a bit scary. Careful what you wish for – one might say. And then came the Super Bowl. During the game, there were two brands who dared to pony up the money for multi-million dollar spots: Hyundai and Audi. Audi, the insurgent brand that has often been willing to take risks, positioned its brand against other luxury autos through years, coming out as the only one with the performance attributes worthy of a James Bond. 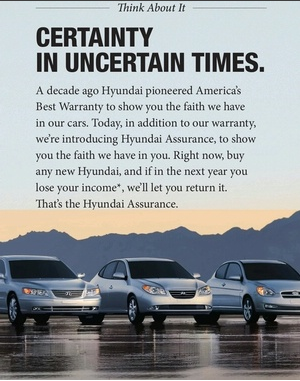 Hyundai, meanwhile, showed compassion for a country of would-be consumers paralyzed by their fear of losing their income. “If you lose your income, we will allow you to return your Hyundai,” the announcer promised. Quite daring. Now, American Express will reimburse you (up to $300, I believe) if you break something you buy with the card or change your mind and are unable to return it. And that strategy has often given me the piece of mind that allowed for the indulgent impulse buy. But this is taking that concept to a whole new level! And rightly so. Truly brilliant, I think, to address the problem head on. To remove the roadblock on the path to purchase. So the message was smart, but equally as important was the audacity on the part of both car companies to see this calamity as an opportunity and to finally gain the unique benefit of television advertising without getting lost in the clutter. Did it work? Yes, it did. Both Hyundai and Audi have experienced increased sales in 2009 – an achievement not to be underappreciated. 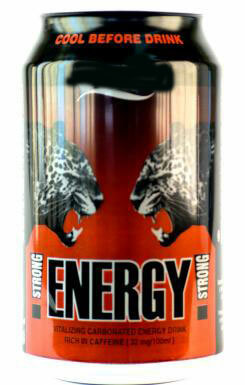 One of my co-workers had a dramatic reaction to an energy drink at work today. She was shaking uncontrollably, got faint and couldn’t move. By the time I came out of the conference room, the entire office had circled her desk. They had tucked her into her office chair with a blanket and were feeding her little bottles of water. Her left leg was like restless leg syndrome to the max, but I was told she was doing better than when this started. There was someone from building security who was on his walkie talkie, and they were all waiting for EMS to arrive. (1) People don’t get out of the way for ambulances. (2) People don’t move into the train to let other people get on. I often find myself saying, “This is one of my favorite foods.” So I thought I would see whether I can limit my favs to a list of 10. It’s not a very healthy list, but oh so good! (8) Malted milk shakes – Ronnybrook in Chelsea Market – to DIE for! (9) Brussel sprouts – do you believe me? It depends completely on how they are prepared. (10) Caramel apples – they have these Wollman Rink. Oh so good. 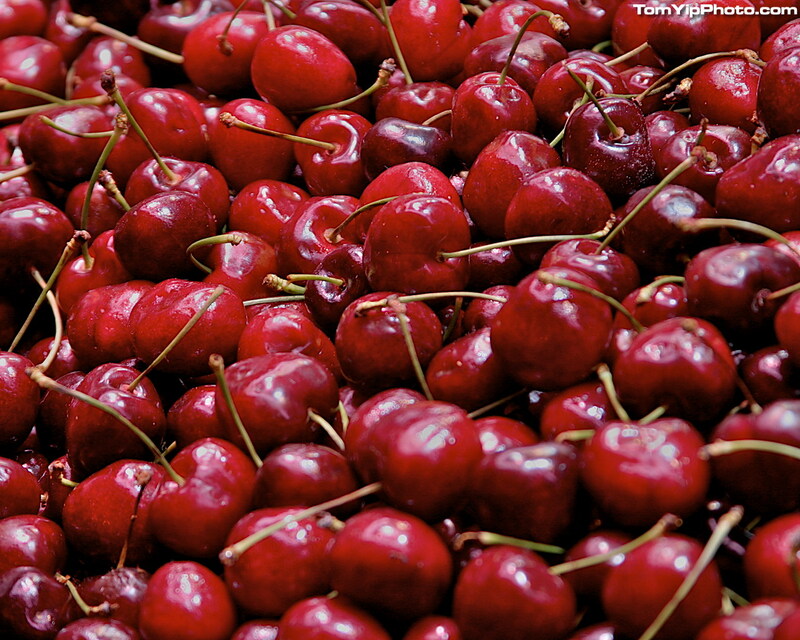 What are your food favs? With each client engagement, my elevator speech gets more complex and lengthy. At this point, I need a ride to the top of the Empire State Building to do it justice. I specialize in doing something that has not been done before – or that I have not done before. I excel in defining and addressing the unknown. In driving revenue growth and profit improvement. In creative problem solving and in bringing structure to chaos or opportunity. And so, I have attempted to summarize this in a one page graphic.